'S e prìomh-bhaile Sudàn a tha ann an Khartoum, Arabais: الخرطوم al-Kharṭūm. (a' ciallachadh: com an oilbheint). Tha e suidhichte far a bheil an Abhainn White Nile agus an Abhainn Blue Nile a tha a’ tighinn an aon mar Abhainn Nile. Canar "the Mogran" ris an àite seo. Tha Khartoum 1,196km air falbh bho Dhiuba (Sudan a Deas), 1,613km bho Chairo (An Èipheit), 686km bho Asmara (Eartra), 2,738km bho Tripoli (Libia), 1,926km bho N'Djamena (An t-Siad), 989km bho Addis Ababa (An Aetiòp) agus 1,970km bho Bhamako (Poblachd Meadhan Afraga). Tha e suidhichte ann an cridhe na dùthcha, aig 379m os cionn ìre na mara. 'S e seo an co-chomharran aige: 15° 34’ Tuath agus 33° 36’ Ear. Tha e suidhichte san àirde a deas na Fàsaich Bhayuda. Chaidh am baile a stèidheachadh le Ibrahim Pasha anns a’ bhliadhna 1821 airson saighdearan às an Èipheit a stèidheachadh an seo. Ach dh’fhàs an tuineachadh nas motha mar àite malairt. Anns a’ bhliadhna 1899 bha Khartoum na phrìomh-bhaile Anglo-Egyptian Sudàn. An dèidh neo-eisimeileachd Shudàn ann an 1956 's e prìomh bhaile den dùthaich ùr cuideachd. Tha am port-adhair as motha ann an Khartoum: Khartoum International Airport. Tha e na laighe ann am meadhan a’ bhaile. Ach thèid port-adhair ùr a thogail ann an Omdurman. 'S e an National Museum of Sudan an taigh-tasgaidh as motha feadh an Sudàn. 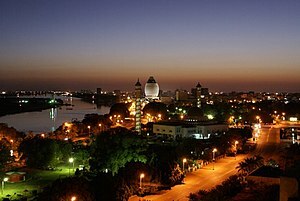 Tha e ann an Khartoum. Tha an dà Temples of Buhen and Semna, a chaidh a ghluasad bho Loch Nasser, ri fhaicinn an seo. Muhammad Naguib: a' chiad cheann-suidhe na h-Èipheite. Air a tharraing à "https://gd.wikipedia.org/w/index.php?title=Khartoum&oldid=498086"